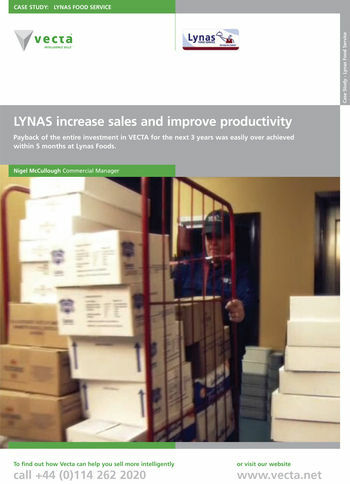 Lynas Foodservice Limited is one of the largest frozen and fresh food distributors in Northern Ireland serving thousands of customers daily. A family run business, the ethos of Lynas Foodservice has always been that the customer comes first. Headquartered in Coleraine, Northern Ireland, Lynas have the capacity to deliver a quality and friendly service throughout the country to thousands of customers with over 50 Lorries on the road everyday and a sales team of 24 supported by an internal telesales team. We found Vecta so easy to use – it's extremely user friendly and the information is presented in a fool-proof format that they can action immediately. We now have full visibility of the sales information we need - so accurate and takes seconds to produce. Our team now spend their time addressing opportunities rather than analysing and investigating data. Since introduction of Vecta our sales team are constantly hungry for information and motivation levels are better than ever as great results are being achieved. Vecta is a member of the Federation of Wholesale Distributors (FWD), the trade association for food and drink wholesalers in the UK.